Water from the Rock is a collection of songs supporting a mime drama about Peter and the disciples as they seek to follow Jesus Christ their Savior and Lord. 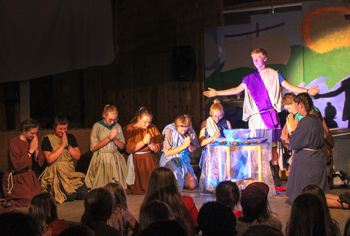 The music and drama were created at Camp Ewalu for the summer of 2018. The music tells the story of Peter and the disciples as they seek to follow Jesus Christ. The songs provide the backdrop for the scenes that were acted out by the camp LT’s (high school students in the camp’s leadership training program). 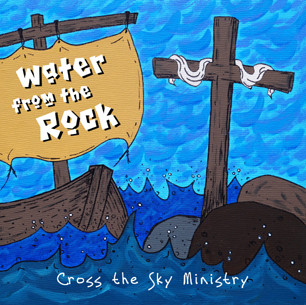 Water from the Rock was written and performed by friends of Cross the Sky Ministries, included several Camp Ewalu alumni. The camp staff had a lot of fun creating the actions for drama, painting sets, choosing costumes, and playing with lighting and special effects. The LT’s did a great job acting out the scenes with lots of energy and enthusiasm! The campers enjoyed seeing the drama each Wednesday night throughout the summer. Thanks to everyone who contributed to Water from the Rock! Thanks to the singers and musicians: Chris Tripolino, Matt Hibbard, Steve Rye, Charlie Rod, Mark Hanson, Richard Bruxvoort Colligan, Dan O’Brien, Eszter Ando, Megan Peterson, Paul, Julie and Katherine Frantsen, Jesse Klosterboer, the Ewalu LT’s and campers. Thanks to the helpers in drama creation, directing, sets, sound, lighting, setup: Ben Davidson (lighting guru), Mama G (sign language), Ellie (spotlight fairy), Abbie (set painter), Riley (shadow of the cross), the Night Campers (fish cross rocks), and Camp Ewalu staff. Thanks everyone! The music features the gifts of many friends of Cross the Sky Ministries! Special thanks to Dan O’Brien for his awesome drum tracks featured throughout the album. Jesse Klosterboer added some beautiful piano pieces to a couple songs. Chris Tripolino played a sweet guitar piece featured in the first song. And a huge highlight of the album is the many talented vocalists (listed below) who added their beautiful voices to the tracks. Special thanks to the Camp Ewalu LTs for their group vocals and random chatter on three of the tracks. Last but not least, the final song features a group of campers in Ewalu’s Explorer program. All praise & glory to our Lord and savior Jesus Christ! Listen to individual songs via the interface below. You can also download individual songs or purchase the entire album at the cdbaby website. Songs are also available on Spotify and iTunes, simply search for “Cross the Sky Ministry” to access music. To purchase a CD from our website, click the “Add to Cart” button at the bottom of this page. Thanks! Water from the Rock CD: $10.00. Click the “Add to Cart” button below. A postage cost of $6.45 will be added to your order at checkout. We send materials via priority mail, which takes 2-3 business days to deliver.